EcoVillage is a unique community in Loudoun County. When it is completed it will have 25 houses clustered on more than 60 acres of beautiful rolling Virginia countryside. Each house is on its own .3 to .8 acre lot; the rest of the land is jointly owned and used by all residents. It includes paths for hiking or strolling – some mown through the meadows and some along the two small creeks that run through the property. There is a children’s playground, and a place to hold bonfires for the whole community. It is amazing to find a place that is within the Washington Metropolitan Area and yet like a neighborhood you’d have found a century ago. The noise of traffic is non-existent, only an occasional car on Taylorstown Road or the distant whistle of the train going through Point-Of-Rocks, about two miles east as the crow flies. The children living here are free to roam the land, and they know that should they need anything they can knock on any door and ask for assistance. Adults enjoy the security of living in a community where they recognize their neighbors but still have their own space to do as they like. The houses are individually designed and built. Some residents have vegetable gardens on their own lots; some others use the area that has been fenced in and is available for any resident. There is one thing that unites the whole community – a strong belief in the importance of a healthy environment. To help preserve its own small corner of it EcoVillage has become part of the Audubon At Home and Monarch Waystation programs, agreeing not to use herbicides or pesticides on the common land or in private yards. Fourteen of the eventual twenty-five houses have been built and others are in the planning stage. Go to the “Lots” section of this website to see what is available for sale now, then contact us to make an appointment to come see for yourself. In addition to the EcoVillage Community Association common land, there are a couple of conservancy lots. Lot A is part of the Community Association, and lots B and C are part of the EcoVillage subdivision, while conservancy lot E is not. 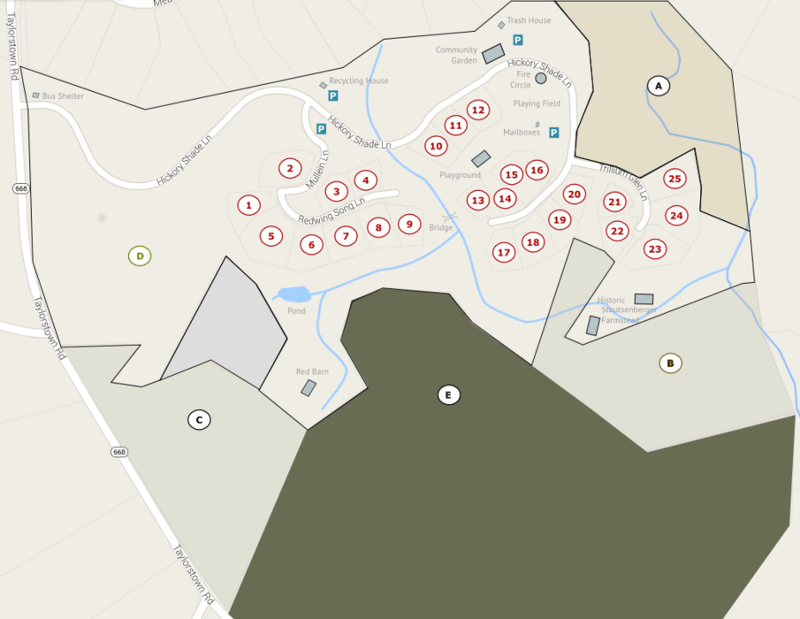 All conservancy lots can be used for walking the maintained trails on them (highlighted with A, B, C, and E in the map).